2017 has ended, 2018 has begun. It’s the perfect time to evaluate your social media strategy and plan out your strategies for the new year. Here are 6 Social Media New Year’s Resolutions for 2018. Social media is constantly evolving. Going by the rapid technology advances and the infinite number of Apps being developed one can only imagine about how to upgrade existing social media platforms or switch to newer and better platforms that are emerging replacing older and outdated platforms. Instagram is rapidly gaining a lot of attention in selfie-crazy India. It’s also easy to upload and share your pics without a lot of content. Instagram stories, in particular, have been a hit among the youth. Facebook’s reach is not what it used to be as the social media platform is pushing its paid advertising service. If you have the money, go for it. Facebook’s lookalike audience feature is very good at reaching out to your target audience. Google Plus’ popularity has waned drastically and has not been able to keep up with its illustrious peers. Twitter, on the other hand, has added a feather in its cap by increasing the character limit. There are others out there and will need another blog post to list them. What’s important is to choose a social media platform that meets your objectives. Each social media platform has its pros and cons and also a particular appeal that makes it unique. Spend some quality time understanding how each one works before jumping onto the platform. Also, it would be worth evaluating your competitors presence on various social media platforms. It will give you an idea where your target audience is and how to reach out to them. Photos, infographics, GIFs, illustrations, and videos are some of the few forms in which visual content continues to have a massive impact on the way people consume information. These will only continue to grow in importance in the near future. “Social listening goes beyond monitoring and replying to incoming questions or comments about your brand. It’s about extracting key insights from social conversations that you can apply to your overall strategy,” says Dominique Jackson of Sproutsocial. Apart from commenting and liking user comments, you need to focus on the details like what are your users talking about, how much time are they spending reading your posts or watching your videos etc. Occasionally, asking your fans or followers to participate in feedback surveys will not only give you an idea about where you need to work on but will also make your users feel that you care. #4: Content continues to be the King! Content whether in the form of posts, blogs, tweets, contests, videos or newsletters not only engages users but it is a favorite of SEO. Want to get more traffic to your blog or website? Content is the key! So focus on creating great content not for yourself but for the users. #5: Facebook, Instagram or Twitter? Choosing the ideal social media platform from among a plethora of available choices can be daunting. My experience says choose a platform that will put forth great content that will showcase your brand to your target audience. In other words, if your potential followers are on Instagram then that’s where you should be and not on Snapchat. Do not choose a social media platform based on how well it’s trending. 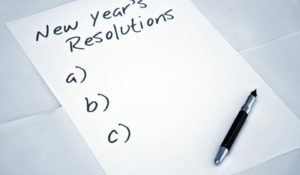 If you haven’t made your social media resolutions yet it’s not too late. And while you make one, just remember that social media is about staying engaged and keeping your users engaged.